Would Dorothy’s shoes have been as powerful if they were lemon yellow? I think not. Snow White’s lips against her “skin as white as snow” wouldn’t have excited the imagination as much if they were petal pink. Ruby, the bold and beautiful birthstone of July is truly iconic. The ancient Hindus called it “Rajnapura” meaning King of Gems. With its deep red color it evokes love and passion. Ancient cultures believed it’s warmth and luminosity came from an internal flame, similar to the passions of the heart; making it a perfect gift for lovers since it’s discovery over 2,000 years ago. Part of the family of minerals called corundum – which encompasses all sapphires. It is only separated from other sapphires by it’s color. A green sapphire is an emerald and a red is a ruby. It is considered one of the four precious gemstones, together with diamond, emerald, and sapphire. In an area called Mogok in Burma the earth is rich with the most beautiful red rubies. With a deep purple red it is called “pigeon’s blood.” Thailand, Sri Lanka, India and recently Kenya also bear rubies. With any purchase of a gem quality stone there are many things to consider. One very important question being- are they conflict free? Currently the dictatorial regime in Myanmar [Burma] makes conditions for the miners unsafe. 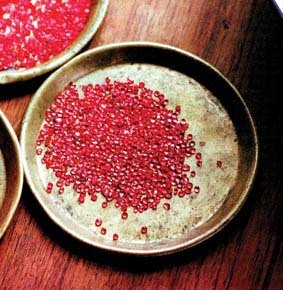 Recently Tiffany’s and many other jewelers have banned the use of Burmese rubies until conditions improve. If looking to buy a Ruby for yourself or a loved one, choose from other sources where the rubies are just as gorgeous and do not bear the mark of human suffering. If you are lucky enough to have rubies as a family heirloom, wearing them is most certainly “conflict free.” My dear friend Laura inherited her grandmother’s ruby ring and earrings. Grandma Fran’s birthday was in July. Her grandfather “Bud” was a New York Yankee who in the 1940’s helped win 4 World Series! He clearly had his “eye on the ball” when it came to giving delightful tokens of love. Birthdays, Valentines and their 40th anniversary were all celebrated with rubies. 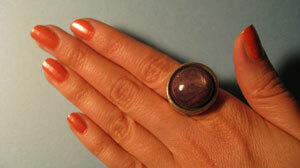 Color Maven Julie also has rubies on her finger. Bright, clear rubies are hugging each side of a diamond in her engagement ring. Her husband Tony knew the power of rubies everlasting love. 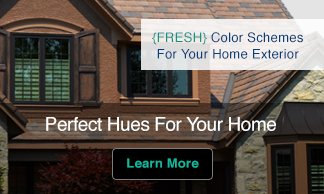 They are also the perfect color stone to compliment Julies fair complexion and red hair. I designed this big beauty using a large cabochon cut ruby. Obviously rubies come in a wide range of quality. This piece is opaque and not “gem” quality. It is from India and galaxies away from the two beauties above, however; it is still a fun everyday ring at an affordable price. I feel like a queen in my king of a gem. Just thought you might like to know… Emerald is a member of the Beryl Family, not the Corundum Family. 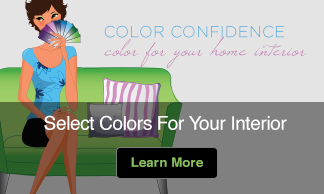 I love the article – you obviously have a passion for color – the top graphic is fun!